Applications are currently closed for the 2017-19 cohort. Please be in touch directly at clergy@joinforjustice.org for more information. 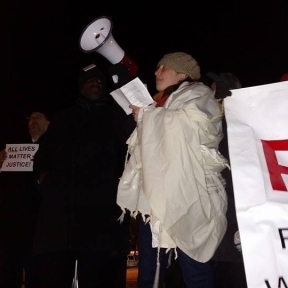 JOIN alum Rabbi Anne Lewis organizes for justice in Philadelphia, Pennsylvania. The JOIN Clergy Fellowship offers clergy the opportunity to explore community organizing and expose select congregants or members to it so they can assess if it can further their community’s mission. Clergy who have already been trained in organizing also benefit from the fellowship’s additional support and training, the focus on helping build a stronger base of support among the membership, and the opportunity to be in relationship with other clergy across the country from all the denominations with similar goals and dreams. High level training in the fundamentals and tools of community organizing, including topics such as: sophisticated analysis of how power works in your own institution and the world around you; propositioning and developing leaders and working with successful leadership teams; strategic campaign planning; uniting a community around a common mission; and, building relational power across different community. Power analysis of the your community and ability to develop core leadership team. Monthly Executive coaching, including three in-person visits from an experienced organizer to help you internalize your learning and apply it to the needs of your own institution. Training for select congregants or members so that they can commit to a common organizing vision with you. Opportunity to build relationships with local leaders across lines of race, class, and religion and a local community organization through which you can make your learning concrete and have an impact on a critical issue facing your community. Meaningful relationships with other dedicated clergy both in your own regional hub and in others around the country where people are engaged in community organizing for justice and community transformation, as part of a national clergy network. Participate in a local, community-wide justice campaign by attending public meetings, meeting with decision makers or community leaders, or educating the public about the issue. Cost: $750 plus travel costs to two retreats in Maryland. The full value to the clergy of the training and coaching provided to clergy and their congregants is approximately $10,000 per congregation. Travel subsidies are available for those who need it. * We are exploring focusing in Atlanta, Baltimore, Dallas, Houston, Greater Miami, New Jersey and North Carolina and welcome interest and applicants from these key geographic areas. Applications are currently closed for the 2017-19 cohort. For more information, check out our FAQ and be in touch directly at clergy@joinforjustice.org.